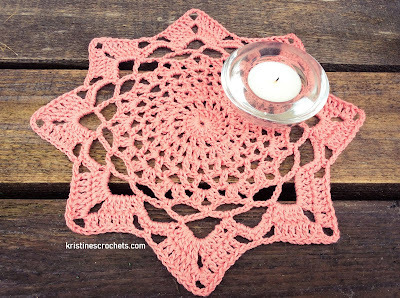 Would you like to learn how to crochet this cute Eight Point Doily? 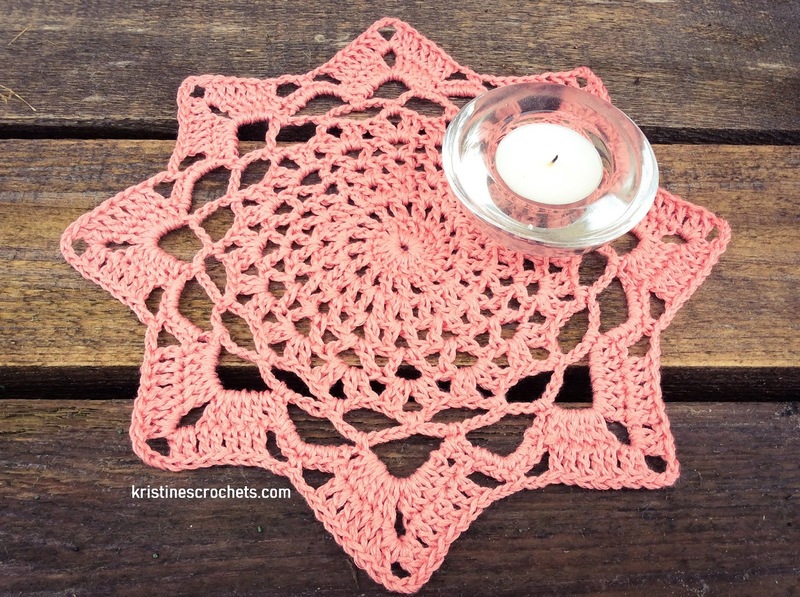 If you can crochet the basic stitches, you are good to go. If you prefer to learn by watching, i have a video tutorial below. Or scroll down to view the written pattern! 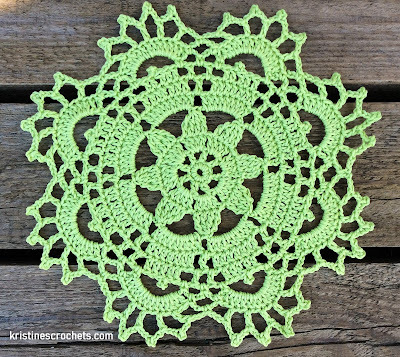 Size: The doily measures approx. 24 cm (9.5 inches) in diameter. Sport weight yarn, size 2 - fine. I used Nako Fiore 25% linen, 35% cotton, 40% bamboo yarn in the colorway 11526 (Pink Coral). 18 grams of yarn needed for this pattern. Start with ch6, join with a sl st. into the first ch to form a ring. Round 1: ch3 (counts as a dc), 15 dc into the ring. Round 3: sl st. into ch1 space, ch3 (counts as a dc), ch1, 1dc into that same ch1 space. ((1dc, ch1, 1dc) into next ch1 space)* repeat 15 times around. ((1dc, ch2, 1dc) into next ch1 space)* repeat 15 times around. ((1dc, ch3, 1dc) into next ch2 space)* repeat 15 times around. ((2dc, ch3, 2dc) into next ch3 space)* repeat 15 times around. Round 7: 1 sl st. into next st., 2 sl st. into ch3 space, ch1, 1sc into that same ch3 space. (ch7, 1sc into next ch3 space)* repeat 15 times around. Join with ch3 + 1trc into the first sc. (1sc into ch7 space, ch9)* repeat 15 times around. ((6dc, ch5, 6dc) into next ch9 space, 7sc into next ch9 space)* repeat 7 times around. (skip 4 st., 5dc, 2dc into ch5 space, ch3, 2dc into that same ch5 space, 5dc, ch2, skip 4 st., 1sc, ch2)* repeat 7 times around. 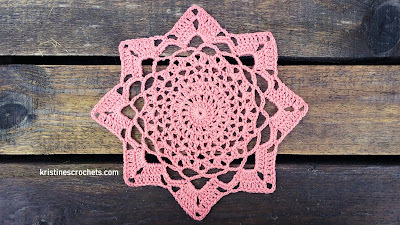 I actually watched the video and made this doily in less than one hour. Your video was very easy to follow. Thank you for sharing. Hopefully you will post a lot more.